We are appealing for your help to sustain the critical work of the ANSWER Coalition in the coming year. This work has been carried out consistently for the past 12 years, in support of the Palestinian people, in opposition to the Iraq and Afghanistan wars, mobilizing against the bombing of Libya and the planned bombing of Syria, for justice for Cuba and all the people of Latin America, a peace treaty to finally end the Korean War, and an end to the wave of horrific and criminal drone killings. ANSWER has played a key role in organizing against the epidemic of racist police abuse in communities across the country. We have stood in opposition to racial and religious profiling that has targeted Muslim communities throughout the country, and the unprecedented spying on the entire population by the national security state. Can you please make an urgently needed donation to help us continue this vital work? Today ANSWER chapters are active in more than twenty cities. Made up of dedicated volunteers and organizers, the ANSWER Coalition has succeeded in training a new and highly-effective generation of young activists. Our chapters are involved in a wide spectrum of local issues. During the recent Syria crisis, ANSWER waged an intense campaign to stop a new war in the Middle East. We mobilized scores of street demonstrations all around the country, helped send tens of thousands of letters to Congress and received extensive media coverage. The seemingly imminent launching of a new and wider war was stopped based on national and global opposition from the people. Instead of a wider and catastrophic war, there is now momentum for a possible shift in the U.S. government’s orientation towards both Syria and Iran. We can never underestimate the power, or potential power, of grassroots opposition. 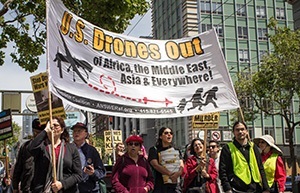 ANSWER activists are frequently-heard voices of opposition to the U.S. war machine in international, national and local media. In addition to numerous educational forums, the ANSWER monthly film series marked its tenth year in 2013. Our work is dependent on the support of individuals like yourself who make invaluable financial contributions. Without this, we could not carry out the daily actions, mobilizations and educational campaigns that are a hallmark of our impactful work. 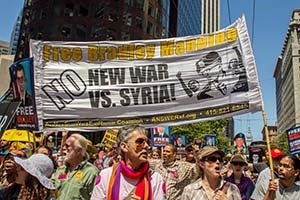 Over the next six weeks, ANSWER Coalition organizers and volunteers will be carrying out an end-of-the-year fundraising drive so that this unique national anti-war/anti-racist movement can carry out its work during the coming year. I ask you to show your support right now by making a donation today. All contributions are tax-deductible. No other organization has such a track record of consistent mobilization, popular education, grassroots organizing and media outreach. We can do this work and build this movement, but not without you. Please show your support today. P.S. Tax-deductible donations can be made to the Progress Unity Fund/ANSWER. Please date your check prior to Dec. 31 for a 2013 tax deduction. Many thanks to Krissana Limlamai and Bill Hackwell for contributing photos.